We were featured in our local paper on Monday. It's a very nice article and we are very flattered. It went from being a hobby to a booming business when a Whole Foods representative called back and said the grocery store chain was eager to carry Nina and Tom's line of onesies, toddler T-shirts and some T-shirts for grownups. Hand-printed with fruits, vegetables, color names and slogans on organic cotton, Nina and Tom's products appeal to the modern parent.Plain white onesies sport strawberries, potatoes, pears, sweet peas. Others read "I eat my vegetables" or "I eat my fruits. "Other hand-dyed T-shirts and onesies make a declaration of their saturated colors, printed with the words "Blue," "Red" and "Green. "The Davis clothing line has been a runaway hit, tripling production in one year and garnering rave reviews in parenting magazines.Nina and Tom have also made a splash at the Davis Farmers' Market where they operate a booth every Saturday, weather permitting. "We feel like we're part of something," said Nina Gatewood, remembering one little boy who bought a "Blue" shirt with money he saved up for weeks.Parents like the shirts because they're made with American-grown and -produced cotton clothing supplied by American Apparel, much of which is organic.Nina and Tom Gatewood not only put their name on all their products, they still create each one, despite having accounts all over the world, not to mention that hefty contract with Whole Foods. "These are not mass-produced," Nina said.She was in the company's small studio on Olive Drive, and behind her, as if to prove the point, Tom screen-printed onesies for an order from Cape Cod, Mass. "They're hand-made, one by one. We sew all the tags on ourselves, put the hang tags on," Nina went on. "Yeah, it's called Nina and Tom, but it's really Nina and Tom. "The company got its start in 2004 during President George W. Bush's second campaign for the presidency. 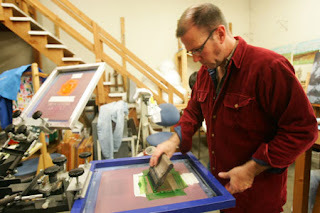 A local clothing designer offered the couple a screen printing table, and Tom took a class on screen printing. 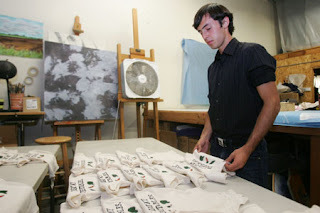 Soon, they were cranking out T-shirts with slogans against Bush that proved very popular in Davis. "We still get requests for our political shirts," Nina said, adding that Nina and Tom political shirts could make a comeback during the 2008 presidential election.In the meantime, Nina and Tom are focusing on growing their business, and keeping up with the growth they're creating.The clothing has caught on all over the world. 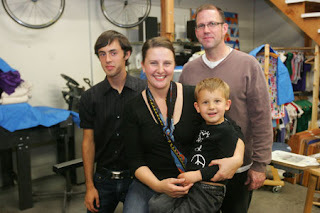 Recently, they received orders from the kingdom of Bahrain, Canada and all over Europe.This year, the company sold about 7,000 items, Nina said, and the company probably will need to start hiring employees and buying more equipment in about a year.For now, Nina and Tom's son Liam, 3, and Tom's son from a former marriage, Kiernan, 16, help out as much as they can.Liam can be seen in most of the company's advertising, grinning his signature grin and sporting a Nina and Tom shirt. Liam was also the inspiration for some of the company's most popular onesies, those emblazoned with "Der Poopinator," "Blobzilla" and "Chubnik," names Tom gave Liam when he was a toddler and the company was just starting up.Tom, who works two shifts as an operating room nurse, spends hours screen-printing and packaging and Nina creates new designs and is responsible for marketing.But with a small operation, everyone does everything, of course. "We try and keep everything really simple," Nina said. "We're trying to keep a low overhead on everything. But it's awesome. Everyone is so supportive. "— Reach Claire St. John at cstjohn@davisenterprise.net or 747-8057. Copyright, 2007, The Davis Enterprise. All Rights Reserved.